Every once in a while, I’ll do a how to guide. This summer I wrote about pineapple and mango — two summer produce that are typically costly to buy prepped and cut up. Plus, I love using the two of these for smoothies, snacks or toppings for overnight oats. But summer is over and fall is upon us, so I’ve traded my fruit for squash. I’ve already tackled delicata squash and spaghetti squash, so why not turn to the most beloved of all squashes: butternut squash. Usually I roast squash and peel away the skin after, but I think this technique of peeling first saves a bit more of the squash and is less messy. After learning How to Peel & Cut Butternut Squash, I made a creamy fall bisque (obviously recipe here). Not in a Pickle Over Here! Want literally the easiest way to make pickles ever? I tried this two summers ago and I’m surprised I haven’t posted this sooner. Easy Fridge Pickles! You skip boiling the brining solution and just add everything straight to the jar. Top sandwiches or eat straight out of the jar. I’ve made dill pickles, sweet pickles, spicy pickles. They’re so easy to tailor and fun to make. The most practical how to ever. How to make Homemade Vegetable Stock. I saw this on BuzzFeed’s Tasty and it’s been a repeat offender for me this winter, so I thought I’d post about it. The ziplock bag fills up quick! Well, maybe quick for me. The first time I made this, I had many stems from basil and the broth had a hint of that. This next few times, I tried to add ginger skin, garlic, more herbs and mushroom to add a more savory aspect. I also really like adding sweet potatoes since they naturally make the broth sweet, as do zucchini, carrots, squash and kale. I don’t add anything else to the broth, i.e. salt — I’m looking at you, since it’s much easier to salt the batch of what you make than try to rectify an overly salty mess. It’s kind of fun to see what you can save and so have fun turning your scraps into something useful. Waste not! Popcorn ready in under 5 min? Um, yes please. Where do I sign up? I was sick of buying bagged popcorn, but I do have a serious addiction to Skinny Pop. I can easily eat at least half a bag per sitting. I wanted the Skinny Pop taste with less of the binge and less of the cost. I picked up a big bag of popcorn kernels at Whole Foods for the same price as a Skinny Pop bag and the kernels lasted me a couple months. Granted, I’ve tailored this recipe to a single serving to prevent me from eating the whole thing, but this can easily be doubled, tripled, quadrupled, whatever. Everything is done on the stove, which requires a bit of “tossing/shaking,” coordination, but NBD. You’ll love this Easy Stovetop Popcorn; your tastebuds (and wallet) will thank me. 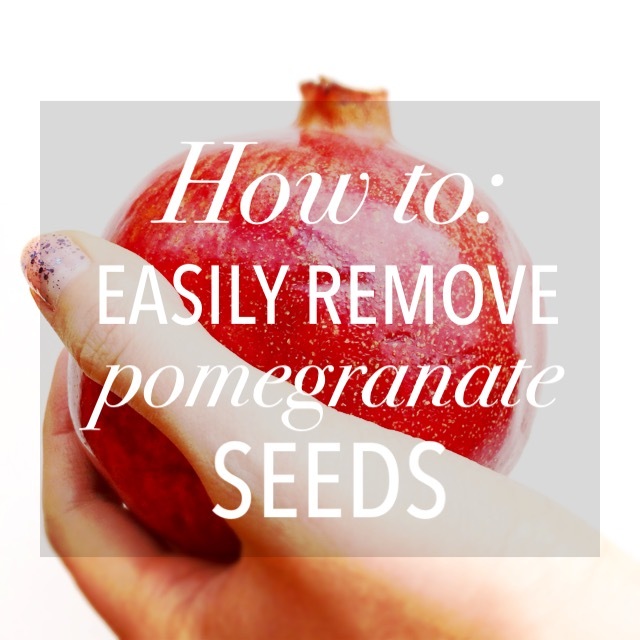 This “how to” is really simple: How to Easily Remove Pomegranate Seeds. This is such a great winter fruit. As a superfood, pomegranates are a perfect snack, a juicy salad or breakfast topping and a natural addition to desserts. You just grab a knife, bowl filled with water, and a wooden spoon. Wear and apron or clothes you don’t care if they’re stained because the juice can splash! But it’s definitely worth the effort. Pomegranate seeds are just so delicious, you can’t help but eat them by the handful. If you haven’t noticed, I’ve been slowly gearing up for this “How to” Maintain Winter Wellness.” Superfood tea, naturally flavored water . 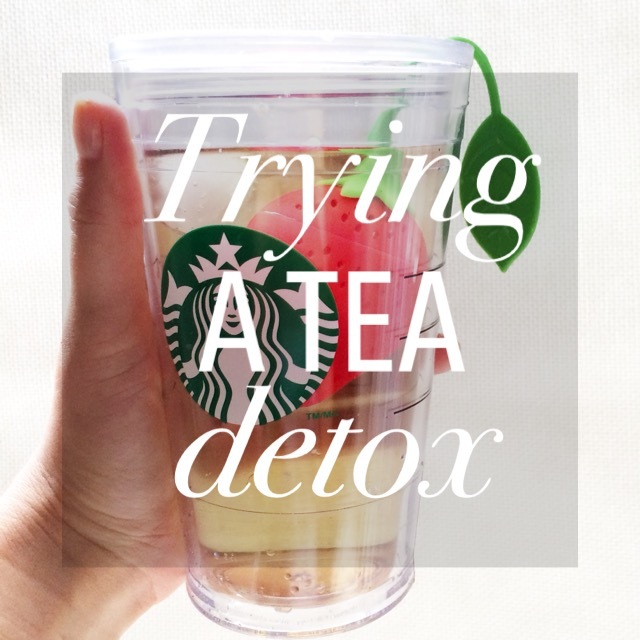 . . all ways to try to give your immune system a quick boost during this cold weather. 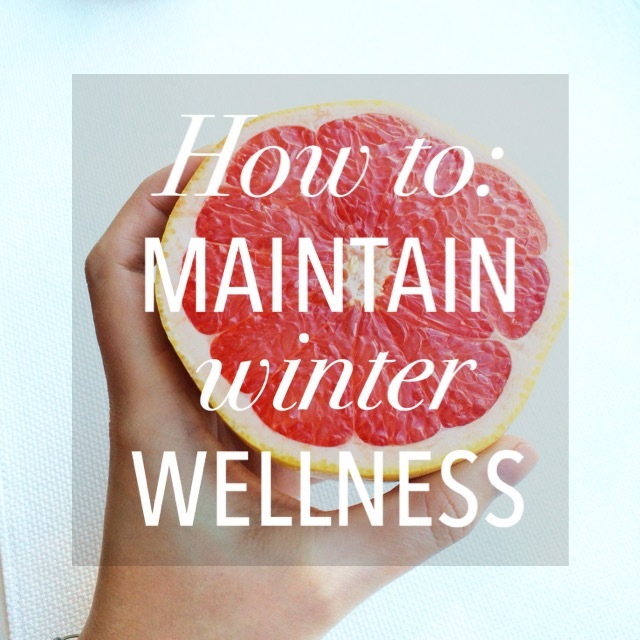 I wish there was a special formula to stay healthy through the winter. Maybe a dash of good luck is all that’s needed, but I do believe there’s something to be said for eating well to prevent sickness. With the flu season upon us, we already know it’s a gamble. Getting sick? No thank you. You wouldn’t run a marathon tomorrow without training, so why not do everything in your power to keep you balanced for tomorrow? Here are some ideas of what I like to incorporate in recipes to help my body stay healthy during the cold winter months ahead. I don’t usually make a New Year’s Resolution, but this year it seemed appropriate, and I thought I’d share. What’s my resolution? 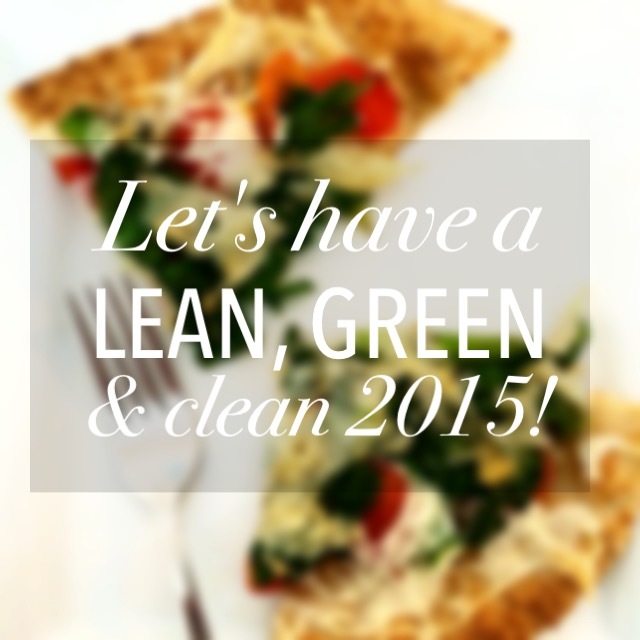 A Lean, Clean & Green 2015. Has a nice ring to it, right? These are ideas I (mostly) already follow. Let’s be honest — I’m no saint when it comes to food. For the most part, I just try to be smart. These are not meant to be strict rules, more like gentle guidelines. They’re just a way to get a better, healthier and more energetic jump start on the new year, and you get to try something new in the process. Like Brussels sprout. Who knows? You may have been like me and swore off them for years until you tried them, and now you love them. Just remember: food’s fun! Let’s savor it together.